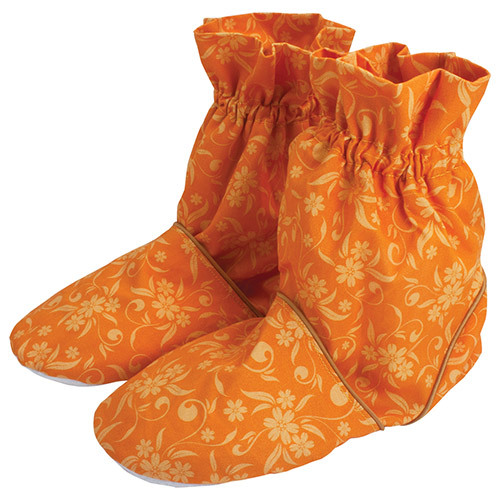 Aroma Home Feet Warmers - Printed Cotton - Apricot feet warmers are infused with Apricot, Mandarin and Orange. These are for when you want to sit back, relax and truly pamper your feet, our heavenly feet warmers will elevate the idea of warm and cosy toes to a whole new experience. The easily removable calico inserts, (one insert on top and the other underneath your toes) when popped in the microwave for 90 seconds release aromatic lavender fragrances providing the ultimate in luxurious comfort and deep relaxation. Turquoise floral feet warmers are infused with Frangipani and Ylang Ylang. Lavender feet warmers are infused with Lavender. Rose feet warmers are infused with Rose, Neroli and Lavender. Warning - Feet Warmers are not suitable for walking in. Heat complete warmer in microwave, making sure filling is distributed evenly. Place half a cup of water inside microwave whilst heating to assist with rehydration. Make sure the turntable is clean and able to rotate freely. Take care when removing from the microwave as product could be hot. Heat for 1 minute then carefully touch test. Then heat in increments of 10 seconds until desired temperature is reached, up to a maximum of 1 1/2 minutes (90 seconds). Below are reviews of Aroma Home Feet Warmers - Printed Cotton - Apricot by bodykind customers. If you have tried this product we'd love to hear what you think so please leave a review. Aroma Home Feet Warmers - Printed Cotton - Apricot feet warmers are infused with Apricot, Mandarin and Orange. These are for when you want to sit back, relax and truly pamper your feet, our heavenly feet warmers will elevate the idea of cosy toes.